“The dynamic generation of the day has insurmountable talent, innate creativity and infinite curiosity. The thirst of knowledge is insatiable and the resources posed to quench it, numerous. To cater to this above growing challenges of this generation, the pedagogy has to be remoulded. This is the heralding of a new era where, what is to be taught has been superseded by how it is being taught. Bringing revolution to methodology of teaching is the concept of smart class in which technology is right next to the blackboard for teachers in the classes. 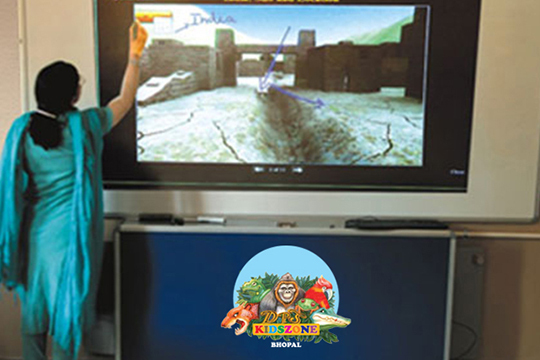 DPS KIDSZONE – Bhopal and the Tata Edge a pioneer publically listed company in the field of education and technology have joined hands together to facilitate teaching learning process and to solve day to day critical educational problems. Tata technology enabled programme smart class offers the rich content repository highly animated knowledge packed, artistically designed pedagogically aligned audio visual modules based on universal concept. Tata Class Edge – an innovation and comprehensive educational solution from Tata Interactive Systems (TIS) – is designed to help teachers deliver high quality intruction, with an effective blend of classroom activities and interactive multimedia demonstration. Based on the Multiple Learning Experiences Model – an instructional framework developed by Tata Interactive Systems – Tata Class Edge aims to enhance students social and thinking skills along with ensuring a thorough understanding of the curriculum content.